Have you ever met someone and tried talking to them and realize they stopped learning anything the minute they graduated school? These sort of people are actually few and far between, thank goodness, but they exist and they are by and far the worst sort of people in my opinion. Learning and knowledge are what make us better people. Now, I don't just mean Math and Biology here, learning is about seeking any knowledge that you didn't know before. I learn something new pretty much every day. The other day I learned about how to wire a CAT5 wall jack. It was not nearly as difficult as I thought it would be. 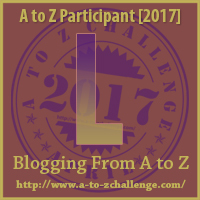 Tuesday I learned the ancient Greek definition of the work Idiot from another blogger (isn't A to Z Blog challenge fun!). Many other types of people cut themselves off from knowledge and learn only what supports their opinion. They put themselves in a little box with blinders so they can't see all of the amazing information the world has to offer. These people may learn something, but they wont learn all sides of it, and thus end up with only partial knowledge, which is terrible. I read an awesome article while doing a bit of research for this post. A 2011 post by a gentlemen name Chris Mooney called "The Science of Why We Don't Believe Science". I could dissect and go on and on about this article, but its a great (though long) article about confirmation bias and why people will disagree with something even when all the facts are laid out in front of them. "All we can currently bank on is the fact that we all have blinders in some situations. The question then becomes: What can be done to counteract human nature itself?"